We are a respected, family-owned business with a proud history of excellence in brokering insurance for more than 25 years. We understand that your insurance needs grow and change which is why we focus on tailoring individual programs to suit your ongoing requirements – our commitment is to Insuring Futures. At Richard Ray Insurance Brokers, we offer more than just a product: we provide a professional, holistic service from advice and valuation to coordination and management of all your personal and business insurance needs. We work directly with our valued clients to implement an insurance program, which guarantees value for money, diversity and choice using the resources available to us through our professional associations with leading industry bodies, the Steadfast Group and NIBA. With offices located in Kadina, Adelaide, Mount Gambier, Millicent, Lameroo and Victor Harbor, we have South Australia covered. When a client visits us, they will experience a firm built on integrity, honesty and reliability, found only in the country. 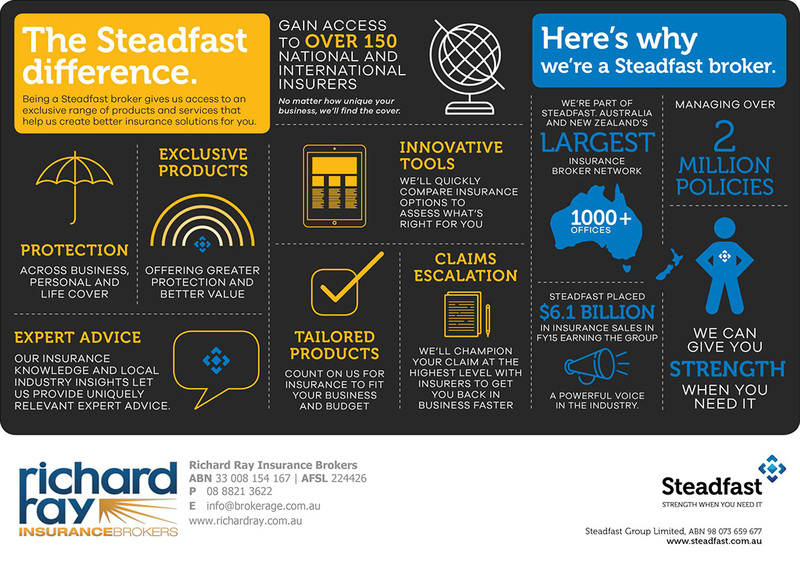 Richard Ray Insurance Brokers is part of Steadfast Group, the largest insurance broker network in Australia and New Zealand.